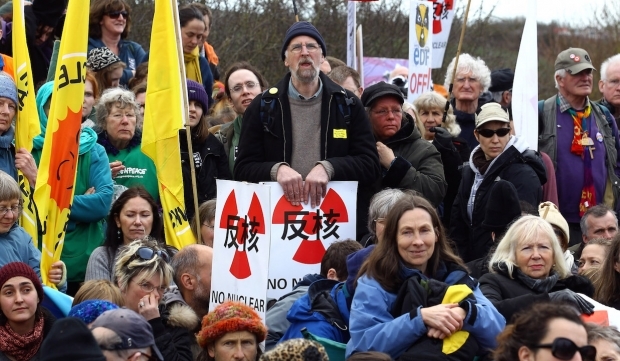 Anti-nuclear protesters gather at the Hinkley Point nuclear power station in Somerset, western England, to mark the first anniversary of the Fukushima disaster in Japan, on March 10, 2012. The site has been earmarked for a potential new nuclear power station currently seeking funding from China. The U.K. and China moved closer this week to finalizing the finance of a highly controversial plan to build the first new nuclear power plant in the U.K. for a generation. The plant, Hinkley Point C in Somerset, western England, is seeking Chinese finance for a French design that has never been successfully built. On a trip to Beijing, Chancellor of the Exchequer George Osborne said Chinese participation could enable the country to develop and own at least one other U.K. nuclear plant at Bradwell, a site earmarked for development in eastern England. The chief executive of the energy supplier RWE Npower, Paul Massara, has also condemned the Hinkley Point plans as an “expensive mistake” that could haunt "our children’s children”. Independent energy price comparison site energyhelpline.comhas claimed that it would cost UK consumers an additional $7.9 billion (£5.2 billion / 51.4 billion yuan) per year on top of current electricity costs. The technical objections begin with the fact that the design, which was drawn up by troubled French company Areva, has never been successfully built, and the contractor Electricite de France (EDF) seems increasingly uncertain that it is possible. In the first attempt, in Finland, construction of the Olkiluoto reactor began in 2005 and was expected to be completed in 2009 at cost of €3 billion. The latest revision to the schedule puts the completion back to 2018 and the latest estimated total cost of the project has ballooned to $9.5 billion (€8.5 billion). A second project, at Flamanville in France, was scheduled to start in July 2005 and enter production in 2012 at a cost of $3.4 billion (€3 billion). This month, that was revised to a 2018 start with costs of $11.7 billion (€10.5 billion). The Taishan 1 and 2 reactors that are of a similar design to those earmarked for Hinkley have also been hindered by delays and cost overruns. Construction of the plant, which began in 2009/10 had a scheduled completion date of 2014 but that has been put back until 2016, while there is little idea of what the extra costs for the delayed project will be. There are no reliable data on costs in China. Doubts are also growing in the U.K. that the country needs new nuclear power to meet its energy requirements. Overall demand is falling as efficiency improves, and greater connectivity with continental Europe gives the U.K. access to cheaper electricity. The U.K. government has guaranteed a so-called strike price for energy produced at Hinkley Point C—if it is ever completed—of nearly three times the current U.K. wholesale price. While it is not easy to predict future wholesale energy prices, there are good reasons to suppose that they will continue to fall in Europe as investment in renewables begins to yield dividends. Supporters of new nuclear in Britain argue that, despite the spectacular growth of renewables in Europe, the U.K. still needs baseload power to guarantee supplies when renewables do not perform. But, increasingly, this view appears technically out of date, and risks holding the country back from reaping the full benefits of the renewables revolution. Even if baseload was still required, Froggatt argues, the expense of Hinkley Point C is hard to justify. Investment bankers and financial analysts, Liberum Capital, points out that for $24.4 billion (£16 billion), for which Hinkley Point promises 3,200MW the U.K. could build 27,000MW of new CCGT gas fired power stations—more than nine times the output. HSBC, the bank that served as adviser to the project, is also highly critical, listing eight concerns about Hinkley Point C in a report in July 2015. These concerns included forecast falls in U.K. power demand, increasing availability of interconnections to Europe that will transform the country’s electricity landscape, overcapacity in Europe which will bring prices down further, the poor track record of the design and the possibility of legal challenge to the deal. “The outlook for sluggish power prices will make the strike price of upcoming Hinkley power look increasingly prohibitive,” the HSBC report added. Even before construction starts, the predicted generating cost of Hinkley Point C has risen sharply. In 2004, EDF estimated the generating cost of a limited series of four reactors , at $41 (£27) per MWh (at 2004 values; or $47.25—£37.2—at 2013 values). By 2012, this had nearly quadrupled to $141 (£92.5) per MWh (at 2012 values) for two units and $136.42 (£89.5) per MWh for four reactors. The expected cost at the start of operations, at the time scheduled for 2024, was $184.47—£121— per MWh. Since then, EDF has announced further delays to the project, which will certainly have cost implications. The cost of construction has shown an equally rapid upward trend. In 2008, the UK government’s cost benefit analysis assumed construction costs of $1905.70—£1,250/kW, plus costs for interest during construction and onsite waste storage, giving a total cost of $4.7— £2.8 billion to build the 1.6 GW reactor. By 2013, this had risen from $18.29—£12 billion to $21.34— £14 billion, according to the government and $24.39—£16 billion for two units, according to EDF. A year later, the European Commission said that the plant would require debt financing of around $25.92— £17 billion (around €21.6 billion) and would eventually have a capital spend of about $51.84–£34 billion (around €43 billion). The construction costs are estimated at $37.35–£24.5 billion (around €31.2 billion). The cost is far higher than the $24.39—£16 billion previously cited by developer EDF Energy, according to the EC, predominantly because it includes, for the first time, the interest costs during the decade-long construction period. There are risks, too, for the Chinese government, which is keen to secure future contracts to build its own reactors in the UK. Involvement with a project that is so widely criticized, even by those who support nuclear power in principle, could raise doubts about China as a responsible partner for a new nuclear age and cast a shadow over the forthcoming visit to the UK by Chinese president Xi Jinping. The controversy over Hinkley Point C is likely to grow as the costs escalate and the technical difficulties remain unresolved. Few of those involved in the project are likely to emerge with their reputations intact.